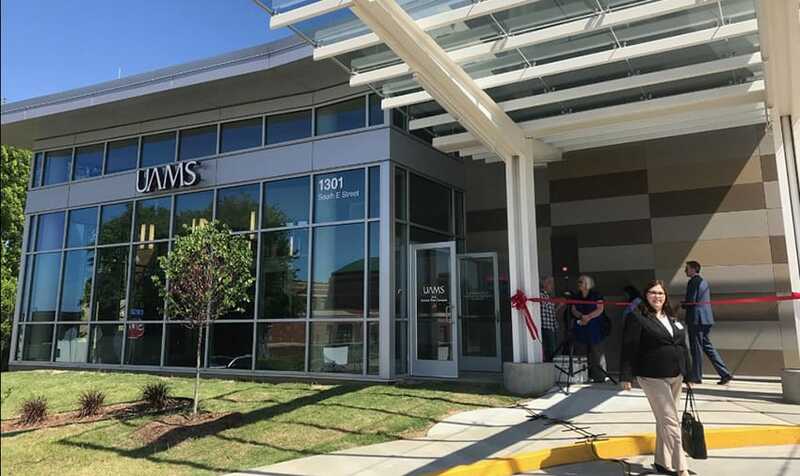 Celebrants start to gather for a ribbon-cutting ceremony and public tours to officially open the new UAMS Family Medical Center on the UAMS West Regional Campus in Fort Smith. May. 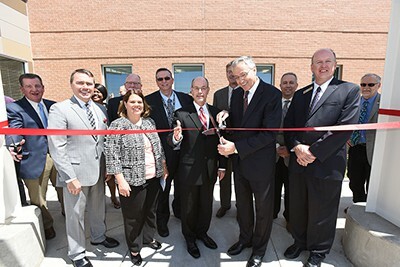 16, 2017 | May 16, 2017 |The University of Arkansas for Medical Sciences (UAMS) West Regional Campus today celebrated the move of its Family Medical Center to a new, more spacious and up-to-date facility at the corner of South 12th and E streets in Fort Smith. The Family Medical Center recently began serving patients after relocating from its building a block away. 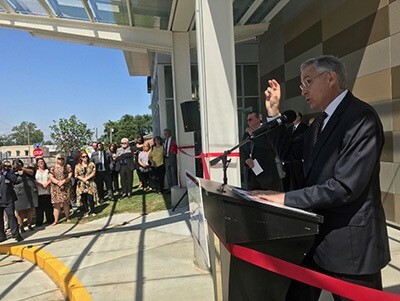 UAMS Chancellor Dan Rahn, M.D., speaks at the celebration of the official opening of the Family Medical Center in Fort Smith. State legislators, local dignitaries, UAMS Chancellor Dan Rahn, M.D., and UAMS officials were on hand for the ribbon cutting at the $10.5 million facility that provides space for the growth and enhancement of UAMS West Regional Campus programs. Groundbreaking on the project was in March 2016. UAMS West Regional Campus provides clinical care and health education services as well as trains medical residents in primary care. It’s part of the statewide UAMS Regional Campuses. Other dignitaries at the event included University of Arkansas System President Donald R. Bobbitt, Ph.D., Fort Smith Vice Mayor Kevin Settle; Dan McKay, Sparks Health System CEO; Tim Hill, vice chancellor for UAMS Regional Campuses; Mark Kenneday, UAMS vice chancellor for Campus Operations; and other state and local officials. Dan Rahn, fourth from the left, prepares to cut the ribbon on the new building. He is assisted by, from the left, Sparks Health System CEO Dan McKay; Katherine Irish Clardy, M.D. ; UA System President Donald R. Bobbitt, Ph.D.; (Rahn) and Fort Smith Vice Mayor Kevin Settle. With about 30,000 square feet in the new building, the number of examination rooms connected to those support areas has expanded to 48, compared to 31 in the older facilities. A consult room is part of each area to provide more space for the team-based approach to patient care, which often includes a physician, nurse, pharmacist and other clinicians. The consult rooms give the teams a larger, separate, private space in which to meet with patients and their families. Construction has begun on a lot for new, additional parking. The older building that was used for the Family Medical Center before the move to the new one will be extensively remodeled in the coming months to consolidate administrative operations into one place, providing new offices, a large conference room and a computer training center. Together, the two projects — the new building and the remodeled older one — will more than double the interior space available for UAMS West Regional Campus, providing growing room for the next 15-20 years. Family Medical Center provides primary care to patients of all ages. The center also offers pediatric and obstetrical care, as well as treatment of immediate medical needs and ongoing management of chronic conditions. It serves 13 Arkansas counties: Conway, Crawford, Faulkner, Franklin, Johnson, Logan, Perry, Polk, Montgomery, Pope, Sebastian, Scott and Yell. Through its programs operating at UAMS West Regional Campus and the university’s other regional centers, UAMS trains medical residents in family medicine while providing clinical care and health education services around the state. UAMS West Regional Campus has graduated 229 residents since it was established in the 1970s, and another 10 residents will graduate June 30.